Boogie! Boogie! Boogie!" Then dive out of sight!" You know, usually that works. Too bad Trevor from The Purloined Boy didn't know the useful ditty. Maybe, just maybe, he wouldn't have ended up in a dark, terrible place called Superbia where bogeymen roam the land looking for children to devour and where the evil Lucian reigns. 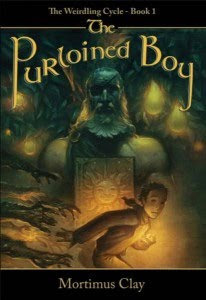 The young adult/middle grade fantasy The Purloined Boy begins with the scene where young toddler Trevor is snatched from his bed by bogeymen and taken the the gray land of Superbia. He joins other children in a nightmarish orphanage full of stolen children and his memories of home nearly vanish. The children there are severely disciplined if they show any memories of home or use the forbidden words "home" or "parent." Unfortunately (or fortunately) for Trevor, at the age of 12 he starts remembering home and starts talking about it. He befriends a girl named Maggie who also lives in the orphange and, aided by a little mouse named Zephyr, he sets out on a complicated journey to find his home. The Purloined Boy pulls readers into fascinating, albeit sometimes creepy new worlds. Superbia, a land of darkness and terror, draws from the things nightmares are made of -- child-eating bogeymen, an otherworldly ruler named Lucian, awful places called "the Pantry" and "the Blackwood". There are bright spots though, too, like "Troth" the great tree lit by golden fruit that exists in a place called Trothward where members of the orders of the Guild (Alchemists, Illuminators and Fishers) reside. And, who can resist a book that includes an "Office of the Inspector of Incorrigible Children?" Clay's creative and interesting story snatched me up and whisked me away into a surprising adventure full of twists beyond my expectations. Really, I wasn't sure that I'd enjoy this book, the first in series called The Weirdling Cycle. Yes, I had my doubts. Add that to the fact that it is posthumously written by a supposedly dead author Mortimus Clay -- that just has odd written all over it. But, most kids like oddities, they like slightly terrifying stories and they love exciting plots. (Those sensitive types that don't shouldn't read this book.) Keeping track of all the characters and their crazy, meaningful names gets a little tricky sometimes, but if you can hang in there, I guarantee this read is worth it. I am eagerly and a bit fearfully awaiting the next title, wanting desperately to know what happens to my favorite little mouse named Zephyr and the bright young boy named Trevor. I stumbled across your blog on twitter! I love it- I'm now a blog and twitter follower! This sounds like a book that my 10yo and I may enjoy. Possibly my 12yo would like this one as well as she likes stories that lend themselves to a terrifying read. I am going to add to the list. Janelle! Thank you so much for being on this tour! I agree that the book is worth it. I have to say that I think the book really picked up in the second half. I think kids will love Maggie as much as Trevor, and since she plays a larger part in the second half, it's important to stick around! Anyway, I appreciate your thoughtful review and thank you again for being on the tour!